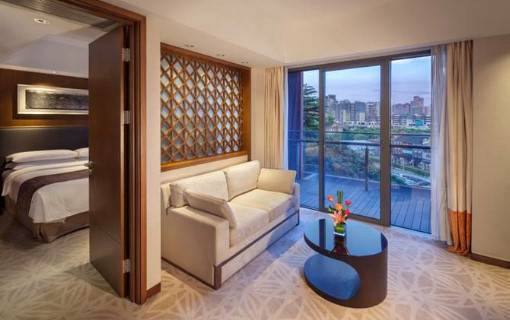 Marco Polo Lingnan Tiandi, Foshan, hosts 390 rooms and suites, including 3 stylish Villas with private gardens and a variety of 1-2 bedroom serviced apartment. All rooms and serviced apartments are equipped to the highest standards with an extensive selection of TV channels, mini-bar/refrigerator, IDD telephone, personal voice mail, high-speed internet access, i-home, hairdryer, tea and coffee making facilities, iron and ironing board and in-room safe. All rooms have a private balcony. 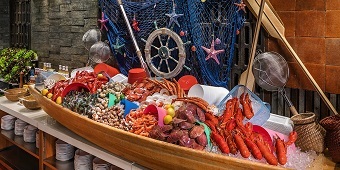 The serviced apartments include a kitchen with all the necessary utensils. 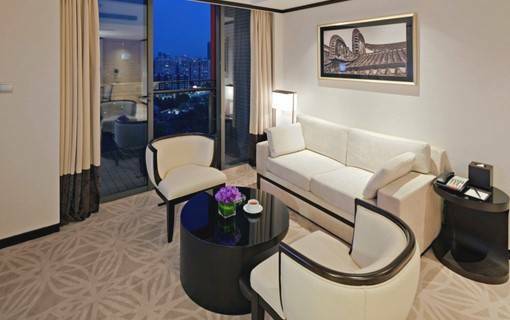 Rooms at the Marco Polo Lingnan Tiandi, Foshan are spacious and comfortable. Ranging from an average floor space of 42sq m/452.1 sq ft to 58 sq m/624.3 sq ft for Superior, Deluxe rooms and Premier Rooms respectively. All rooms are tastefully designed for comfort and are equipped with all the requirements of today's international travellers. Located on 5th to 13th floors, Standard Room offers Twin beds. 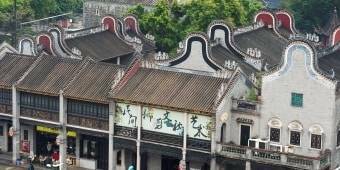 The room has a private balcony with Foshan Lingnan Tiandi or City Centre view. Wi-Fi internet can be connected in every room. 42 sq m. / 452 sq ft. 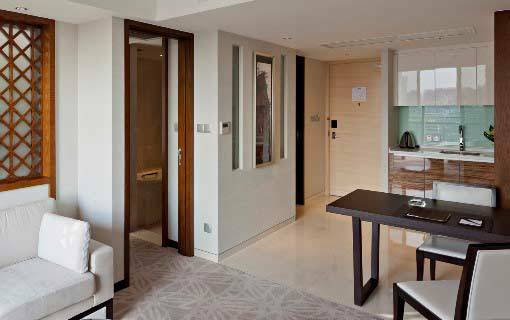 Located from the 5th to the 13th floor of the hotel, Superior Rooms offer a space of 42 sq m / 452.1 sq ft. The rooms are well equipped with all the necessities of today's international travellers. 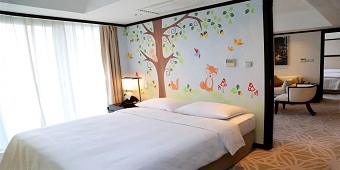 Deluxe Room is designed to provide more floor space for room sharing guests. Each room is more spacious than regular guestroom and is furnished and equipped to high standards. The Premier Room is designed to provide more floor space for room sharing guests with a separate living room. The room is well furnished and equipped to high standards. 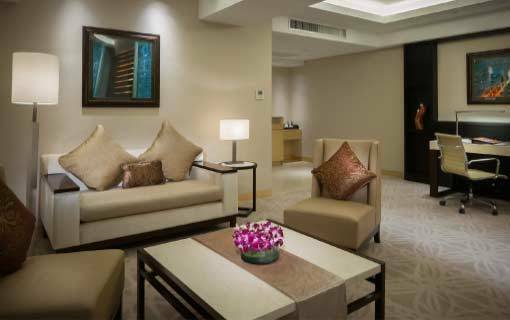 Located on each guest room floor, the hotel offers elegantly designed and furnished Suites with average floor space of 82 sq m / 882.6 sq ft. Guests staying in Suites will enjoy exclusive access to the Continental Club Lounge situated on the 15th floor. Located on 6th to 16th floors, the well designed and furnished Superior Suite is equipped with international-standard amenities. Located on 6th to 16th floors, the elegantly designed and furnished Deluxe Suite is equipped with international-standard amenities. The Continental Club floor is located on the 15th and 16 th floor, It has been created for those who appreciate the extra level of convenience, personal service and value. 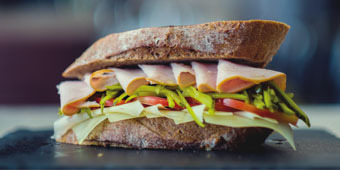 Continental Club Floor offers a range of extra benefits, and we take pride in providing personalised services. 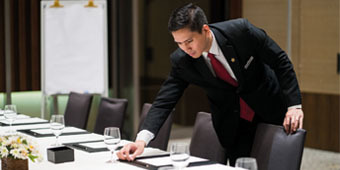 Be it restaurant reservations, theatre tickets, flight confirmations or packing and unpacking, we will be more than happy to assist. 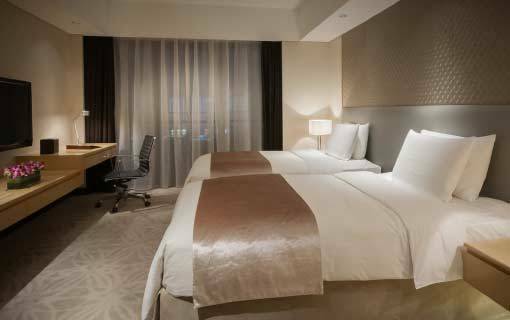 Located on 15th & 16th floors, Continental Superior Room offers a comfortable space with Queen bed or Twin beds. 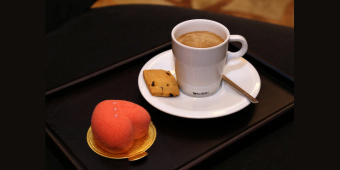 Guests can enjoy privileged Club Lounge access and services. 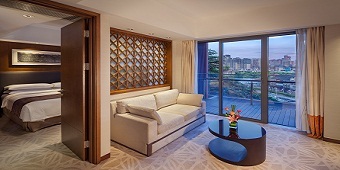 The room has a private balcony with Foshan Lingnan Tiandi or City Centre view. 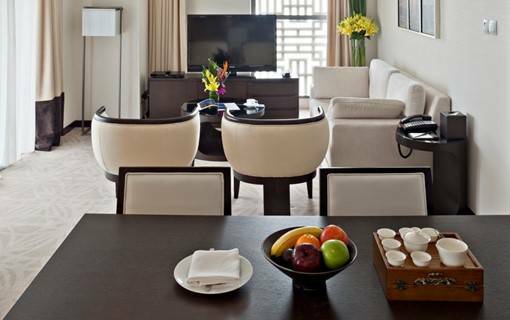 Located on the 15th & 16th floors, Continental Club Deluxe Rooms offer a space of 58 sq m / 624.3 sq ft. The rooms are well equipped with all the necessities of today's international travellers. Located on the 5th floor and flooded with natural sunlight, the Villa features a separate pavilion. Each Villa also includes an oversized bathroom overlooking the Villa’s own private landscaped garden, offering guests a private sanctuary for relaxation or just to enjoy the company of friends and family. Located on the 5th floor and filled with natural sunlight, the Villa features a separate pavilion. Each Villa includes a spacious bathroom overlooking the Villa's own private landscaped garden, offering you a private sanctuary for relaxation or enjoyable time with friends and family. 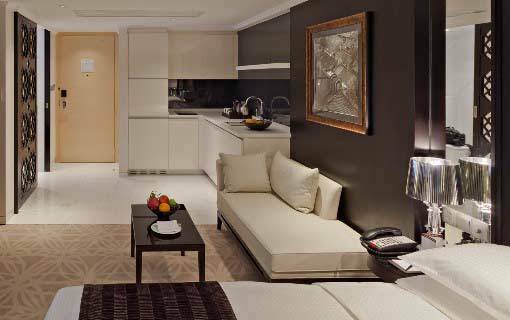 For guests who require a "Home-Away-From-Home", experience the comfort of the fully equipped serviced apartments. The hotel offers Studio apartments and 1 to 2 bedrooms apartments with floor space from 42 sq m / 452.1 sq ft. to 125 sq m / 1345.5 sq ft. Located on 5th to 13th floors, Studio Apartment offers a comfortable space with Queen bed. 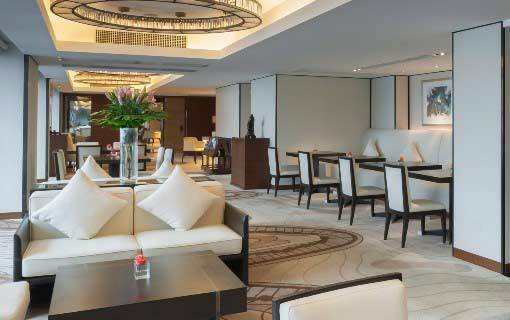 The room is well equipped with open kitchenette with utensils and balcony with Foshan Lingnan Tiandi or City Centre views. 42 sq m. / 452.1 sq ft. Located on 5th to 13th floors, 1-Bedroom Apartment offers a spacious room with King bed. 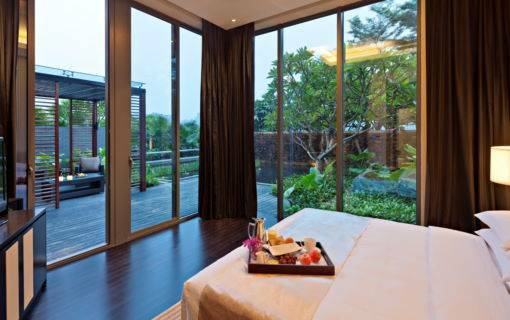 The room is well equipped with open kitchenette with utensils and balcony with Foshan Lingnan Tiandi or city centre view. 58 sq m. / 624 sq ft. Located on 6th to 13th floors, 1-Bedroom Executive Apartment offers spacious space with King bed. 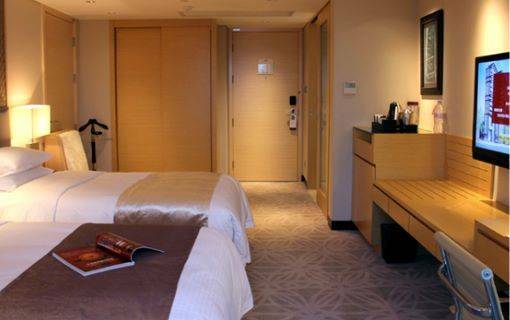 The room is well equipped with open kitchenette with utensils and balcony with Foshan Lingnan Tiandi or City Centre view. 82 sq m. / 882 sq ft.
located on the 16th floor, 2-Bedroom Executive Apartment offers a very spacious and comfortable space with King bed. 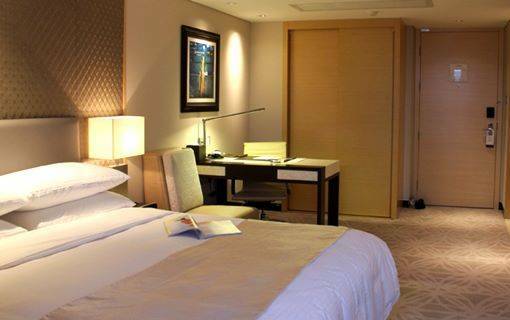 The room is well equipped with open kitchenette with utensils and balcony with Foshan Lingnan Tiandi or City Centre view. 120 sq m. / 1291 sq ft.